We arrived in Honolulu the day after the day of infamy (Dec. 7). 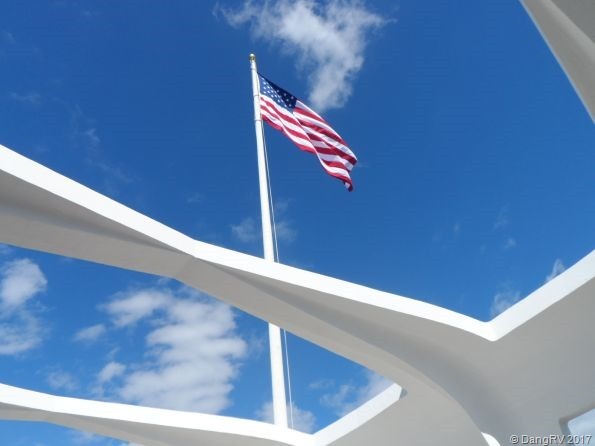 That worked out fine since due to memorial ceremonies on that day, access to Pearl Harbor is limited. The night before we arrived, we read a newspaper I had bought on the aircraft carrier I toured last summer in Corpus Christi. 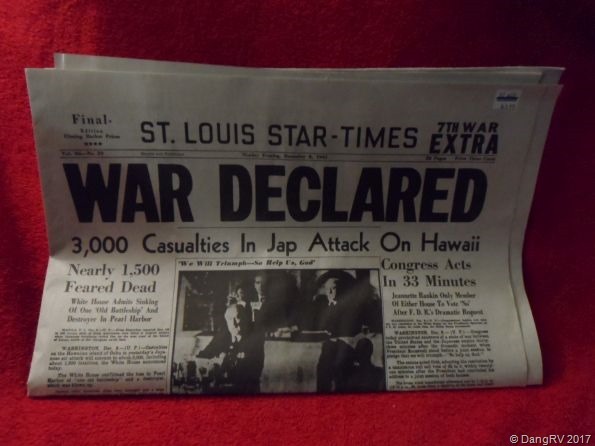 It was a copy of the St. Louis Star Times from December 8, 1941. I highly recommend reading such a newspaper when you can. There was so much more going on that day with other islands elsewhere in the world attacked, Thailand falling to them, Hong Kong and Singapore and the Philippines attacked. The newspaper also showed our government’s initial response as just an “old battleship” and a destroyer were sunk. Huh?! I know newspapers are glory hounds and not necessarily the truth but it does provoke further thought and the urge to research further. Excursions for Pearl Harbor were all booked up long before the cruise. The cruise line added another excursion shortly before the cruise due to demand. There are other options. There are plenty of other tour companies you can book a tour through if you wish such as Robert’s of Hawaii. You don’t get the guarantee of the ship waiting for you if you are late but the ship didn’t leave Honolulu until 11:30pm so for Pearl Harbor tours it really isn’t important. You can also save a bunch of money and see much more by going on your own. Rental cars are available if booked well in advance as are local buses. Due to how crowded the memorial gets with so many tours coming in, you will need to get your ticket online before going. To score one, you need to be online as soon as sales open at 7am Hawaii time 60 days before your arrival. There is also a 24-hour window when the park releases additional tickets online. 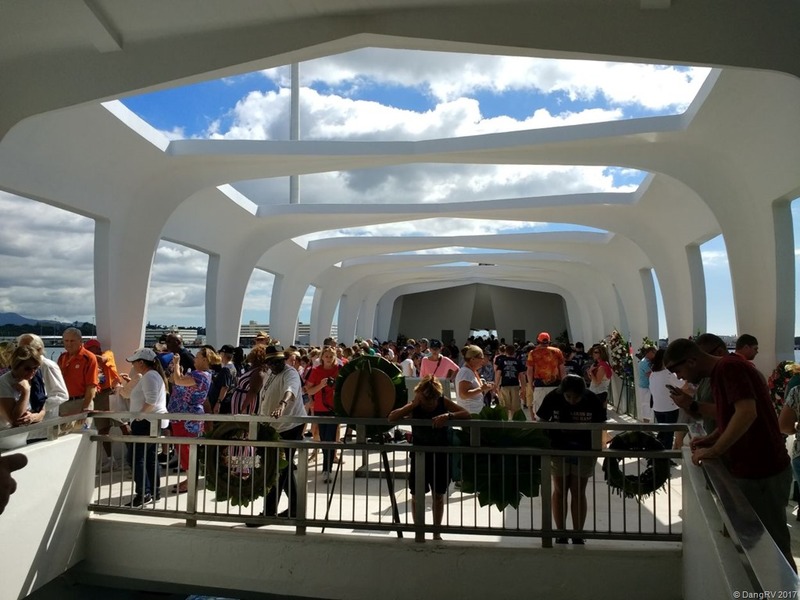 The cost is FREE with $1.50 service fee for just the tour of the USS Arizona Memorial. Other tours are also available at additional cost. See recreation.gov for tickets. 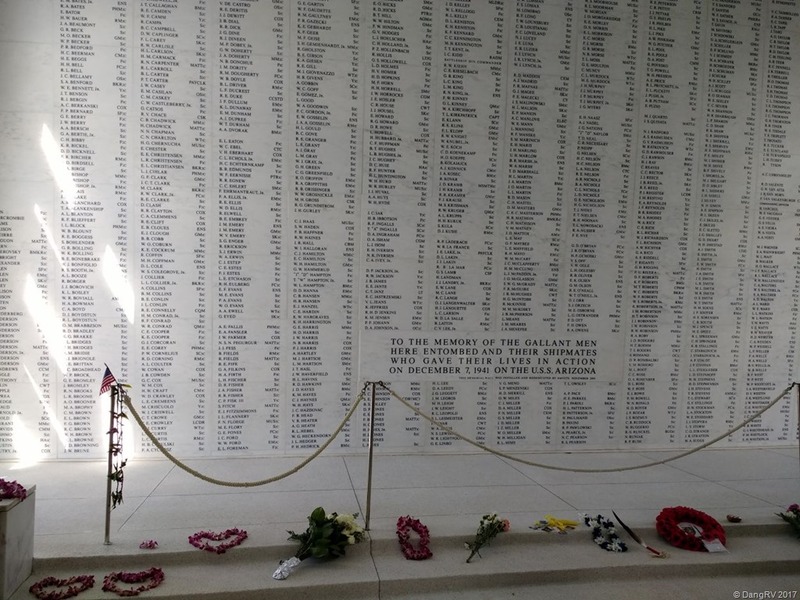 If you want to try walking in, the memorial opens at 7am Hawaii time so get there early. They hold back 1300 tickets for walk-ins. We booked an excursion. We would have liked to go on our own but we had scheduling issues as we were also going to do a luau there which required us to be back at the ship to be picked up by 3:30pm. You don’t get to see nearly as much of the memorial on an excursion so if you have the time, go on your own. You may need more than a day to see everything so see it again if you fly to Hawaii instead of cruising. We hopped on a tour bus on the pier. They pointed out the coral pink VA hospital (Tripler Medical Center) which is the largest military medical center and covers a vast amount of territory in the asian pacific. 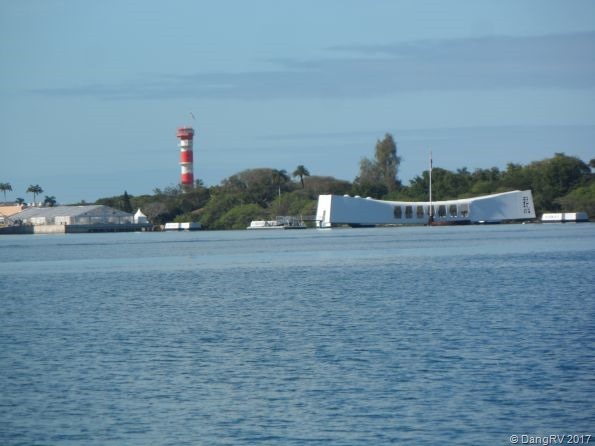 At Pearl Harbor, we got on a boat out to the USS Arizona Memorial. It was pretty awesome I thought. Did you know Elvis Presley donated money to build the memorial? You can’t see a lot of the ship but it is still pretty humbling. The wall of names there and stories of that day can make you cry. 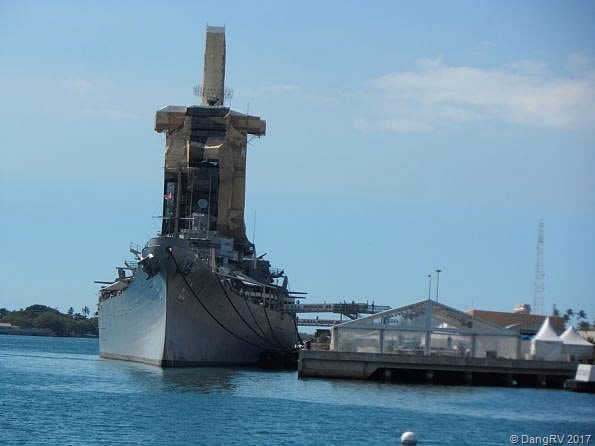 Nearby is the USS Missouri on which the Japanese surrendered. The USS Bowfin submarine is also nearby for a tour. Back on shore, we toured the museum a bit, bought sandwiches, chips, and drinks for lunch, and hit the gift shop. I got several new stamps in my National Parks Passport. Back on the bus, we got a little tour of Honolulu and the national cemetery. We got back to the pier with half an hour to spare before the luau bus picked us up. Not enough time to go back on the ship. Here too you have choices. Lots of folks booked the Germaine’s luau excursion through the cruise line to play it safe. Those folks got the cheap seats on the outskirts of the luau which were still good seats. I booked directly through Germaine’s website with them and got us seats in the middle section for the same price and maybe even cheaper. Ours also came with shell necklaces and 2 free drink tickets. Soda is free but alcohol costs if you don’t have a drink ticket. Many others also booked direct and some on the ship excursion filed against the price matching guarantee to get some money back. The funny thing is we were all picked up by the same buses hired by Germaine’s so the issue of not getting back in time was moot. With half the ship there and many of them on a ship excursion, there was no way we would be left behind. The luau was wonderful! It is on the beach on picnic tables in sand. They roasted a pig in the ground and had a ceremony when they brought it out. It tasted delicious as did everything they served for dinner. They sounded a conch shell for dinner. 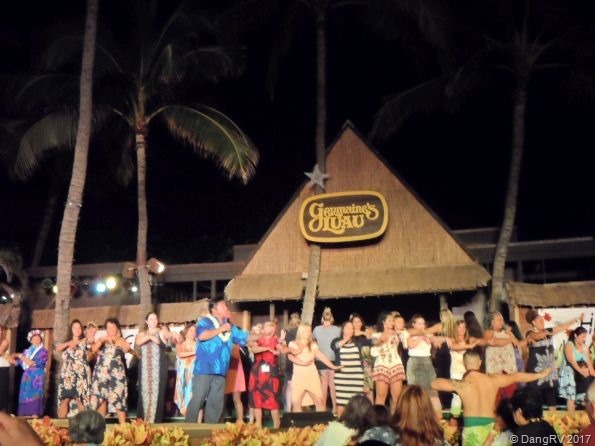 The entertainment was very good and interactive as they brought folks up on stage to learn to hula. If you bought their tiki mug, you would get twice as much drink than if you just drank from their plastic cups and for no extra charge for the extra drink. The tables had fresh pineapple on them which we enjoyed very much. There was lots of time to eat and enjoy the night. I would definitely go to this luau again. By 10:30-11pm, they delivered us back to the ship quite satisfied and tired from a long day.